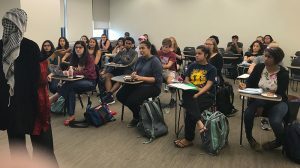 Our Arabic program has been delighted to welcome Palestinian poet and journalist, Fatena Alghorra to an informal conversation with our Arabic students at Loyola University Chicago on September 20, 2017. Fatena has four books of poetry; one received a prize for best Arabic translation into Italian. A fifth book is forthcoming in Arabic and Dutch. In 2012, Fatena won the El Hizjra prize for Dutch language writers of diverse background. She works as a freelance journalist for Al Jazeera, a lecturer and an organizer of poetry events in Belgium and the Netherlands. 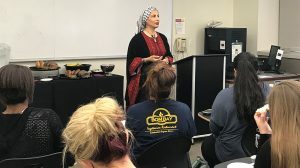 Please enjoy excerpts of our Arabic students’ reflections on her lecture as part of their Culture Portfolio assignments. “Fatena said, “There are many reasons to cry, we must find reasons to laugh.” Form the beginning her energy shifted the landscape of the room…when I asked her how she finds home when you are homeless, she gave the most beautiful, inspiring answer. 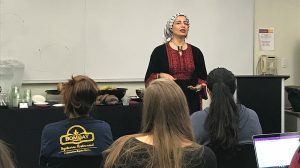 She said she found peace in her poetry, something I also connect with.” Larenze, Arabic 103).